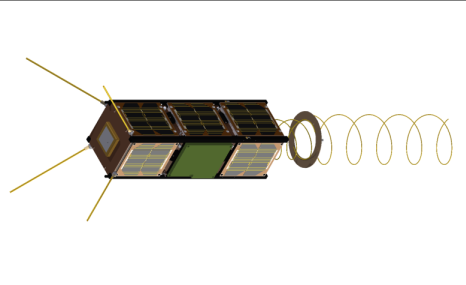 Led by GOMspace in Denmark, GomX-3 is a 3U CubeSat mission to demonstrate aircraft ADS-B signal reception and geostationary telecommunication satellite spot beam signal quality using an L-band reconfigurable software-defined radio receiver. A miniaturised high data rate X-band transmitter developed by Syrlinks and funded by France’s CNES space agency is being flown as a third-party payload. The satellite was deployed from the International Space Station on 5 October 2015 at 14:05 UTC. GOMX-3 was launched to the ISS in August 2015. The primary mission of NanoRacks-GOMX-3 is to test a number of new or improved payloads in space. NanoRacks-GOMX-3 tests a software-defined radio (SDR-RX), which is tuned to receive L-band signals and an automatic dependent surveillance-broadcast (ADS-B) receiver that receives ADS-B signals from airplanes. It also examines an improved Attitude Determination and Control System (ADCS) that verifies among others reaction wheels, Fine Sun Sensors, and thermopiles. An X-band transmitter that tests the possibility to send 3 Mbps from a CubeSat is also part of the NanoRacks-GOMX-3 investigation.